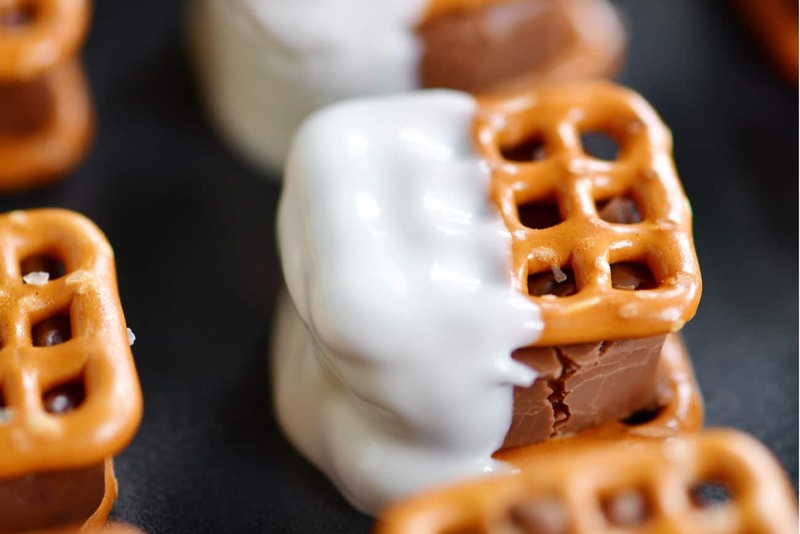 Halloween Candy Bar Pretzel Bites are easy to make with mini candy bars sandwiched between pretzels. 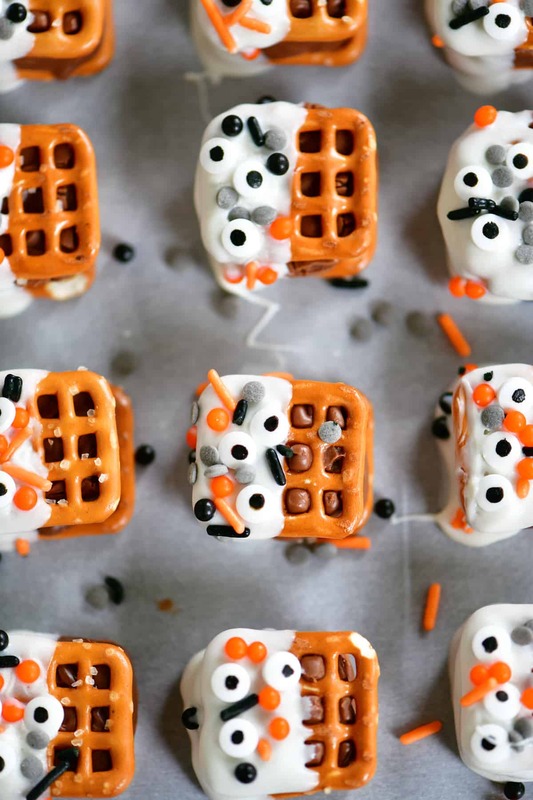 A spooky treat that is perfect for Halloween parties! Candy bar pretzel bites are one of my go-to holiday treats. 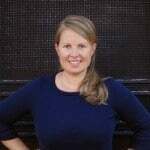 They are easy to make and easily customizable for any occasion. When I found some spooky eyeball sprinkles at the store recently, I knew I had to make a Halloween version. My son took these to a bonfire to share with friends and there weren’t any leftovers. 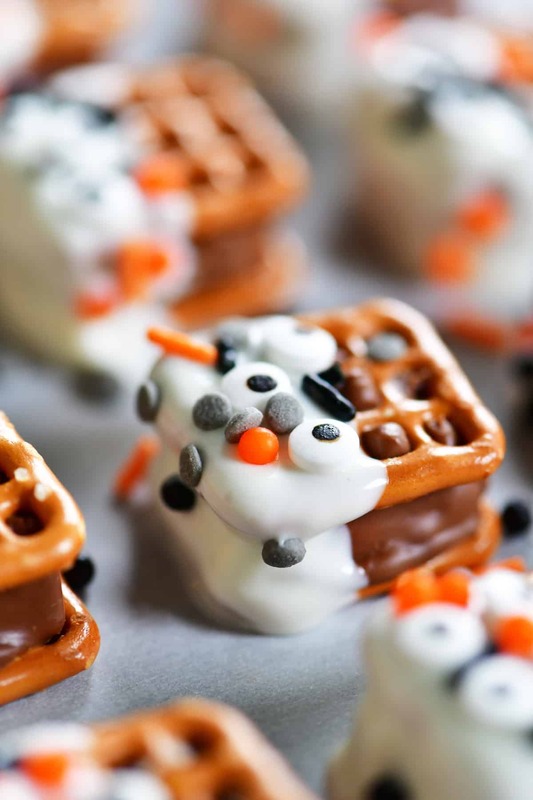 Where is the recipe for the Halloween Candy Bar Pretzel Bites? 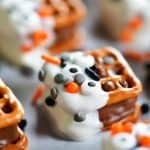 In this post, I will share step-by-step instructions with photos for making the Halloween treats, as well as answering FAQs about the recipe and showing a video of the recipe. But you can go directly to the recipe by scrolling down to the bottom of the post. 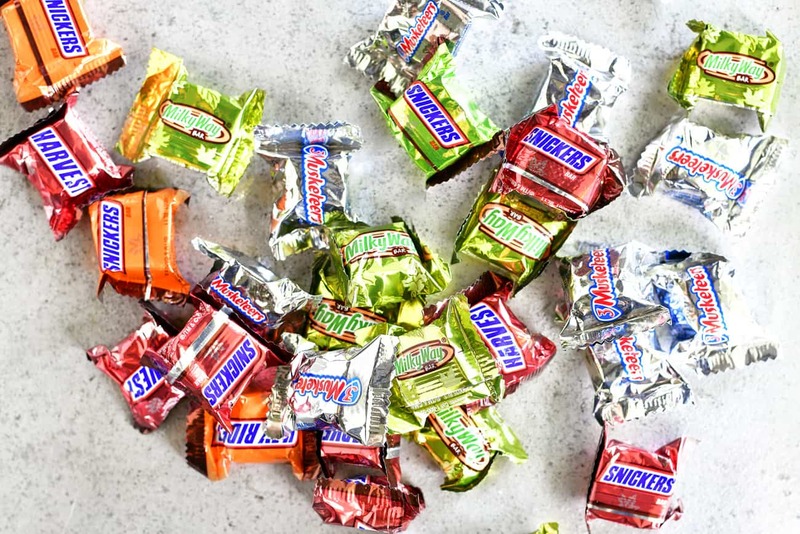 Start with a package of bite-sized candy bars. The package I used contained 3Musketeers, Milky Way, and Snickers (I didn’t use the Twix bars). You can also try Reeses Peanut Butter Cups, Hershey’s Kisses, and Rolos. 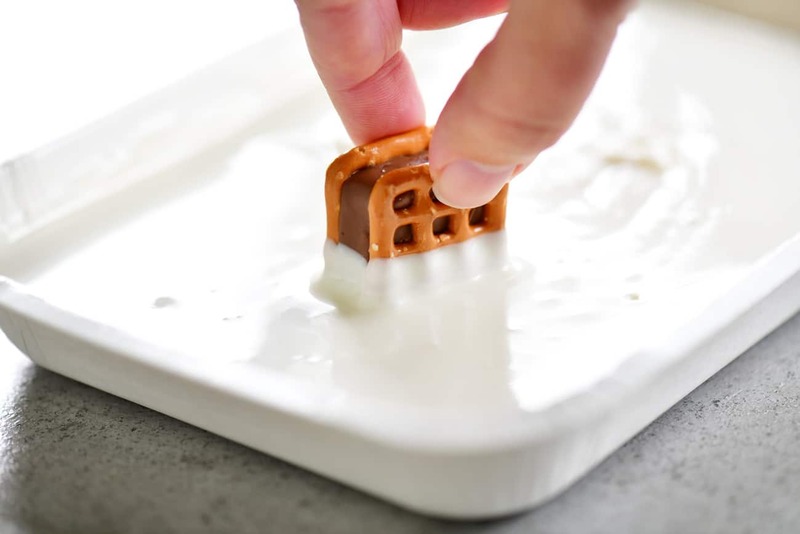 Unwrap one candy bar for each pretzel bite you want to make. Spread the pretzels out on a rimmed baking sheet in single layer. When making a large number of these Halloween candy bar pretzel bites, start with only a portion of the pretzels and do the rest in batches. 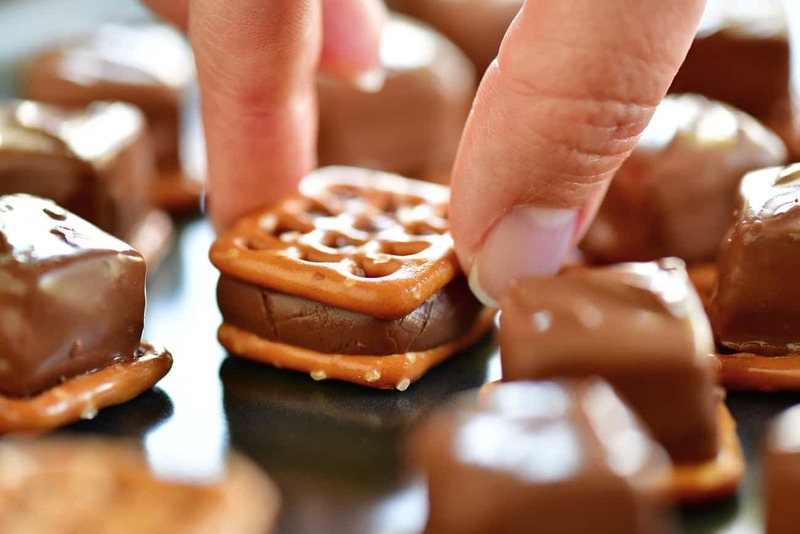 I like using the square checkerboard shaped pretzels to make candy bar pretzel bites. They are the perfect size for the bite-sized candy bars. Put one bite-sized candy bar on each pretzel. Bake at 300˚F for about 3 minutes to soften the candy bars. Working quickly, press another pretzel onto the top of the softened candy bar. You’ll want to press hard enough to squish the pretzel into the soften chocolate but not so hard that you break the pretzel in half. If the top pretzel won’t stick because the chocolate cooled too much and started to harden, return the candy bar topped pretzels to the oven to soften again before continuing. Melt white candy coating or vanilla almond bark in the microwave according to the instructions on the package. Dip the candy bar pretzel bites in the candy coating. Place the dipped treats on a piece of parchment paper on a baking sheet or on a silicone mat. Immediately top with Halloween sprinkles before the candy coating hardens. Allow the candy coating to harden and set before removing from the pan. 1. Where can I find the square pretzels? 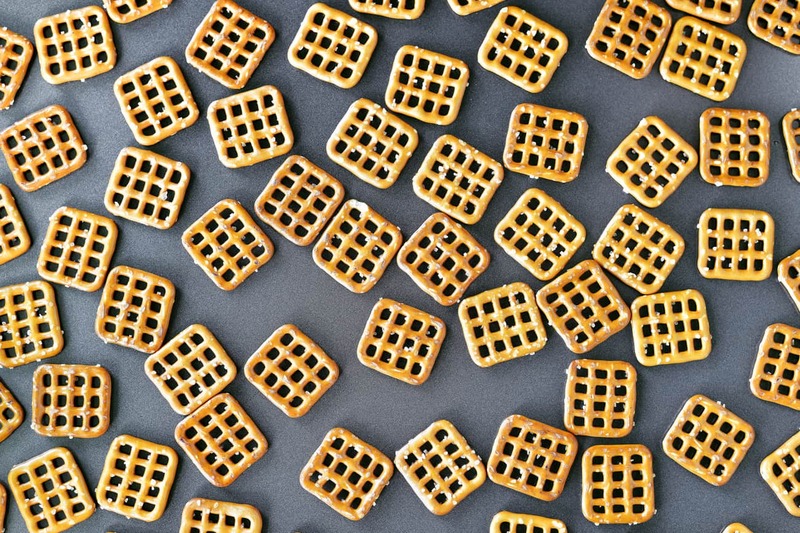 The pretzel used to make these pretzel bites are called snaps and are widely available at grocery stores in Minnesota. You can also purchase them online here. 2. Will pretzel twists work instead of the square pretzels? Yes, you can use pretzel twists as well. 3. Can these pretzel bites be dipped in melted white chocolate chips? I love using white candy coating that comes in a small tray because it is so convenient but white chocolate chips will work too. If you are having issues dipping them in the melted white chocolate, you can thin it with a little shortening. 4. 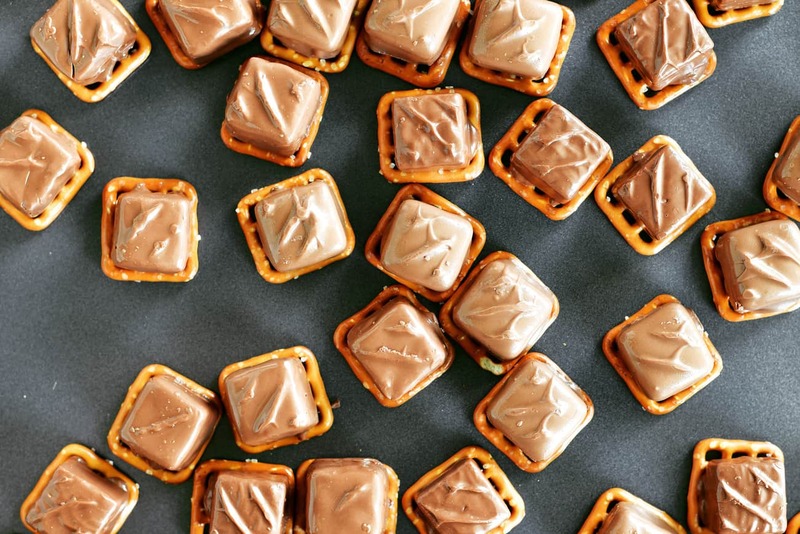 Have you ever frozen these candy bar pretzel bites? Are they soggy after defrosting? Yes, you can make them ahead of time and freeze them. No, they are not soggy after defrosting. Peanut Butter Cup Pretzels: Peanut Butter Cup Pretzels are so easy to make for Christmas and they look festive too! Try them for your next holiday party! Pretzel Turtles Recipe: You can satisfy your sweet tooth in a hurry with Pretzel Turtles! There are only 3 ingredients, pretzels, caramel filled chocolates and nuts! Crispy Peanut Butter Bites: Crispy Peanut Butter Bites are so much easier to make than peanut butter balls or truffles. Sandwich dough between pretzels and dip half in white chocolate! Spread 20 pretzels out on a rimmed baking sheet in a single layer and top with the mini candy bars. 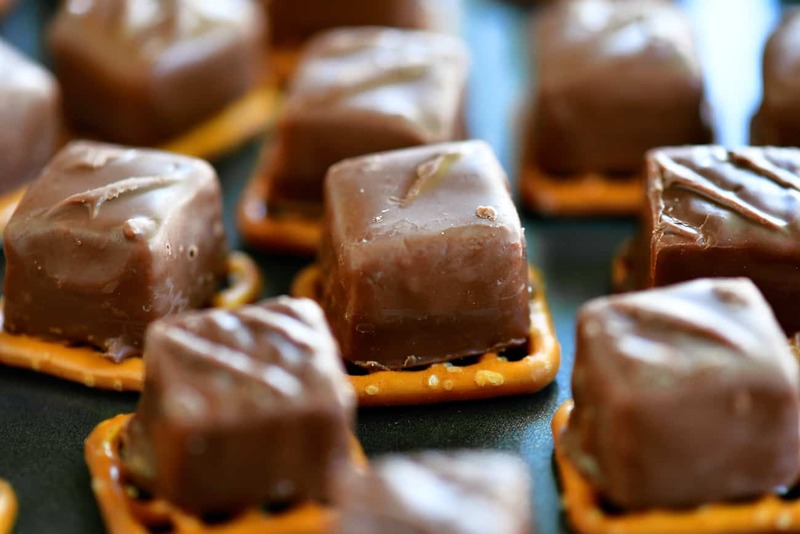 Press an additional pretzel into the softened chocolate of the candy bars. Melt the vanilla candy coating according to the instructions on the package. Dip the candy bar pretzel bites in the candy coating, place on parchment paper or a silicone mat and top with sprinkles. Allow the candy coating to harden. Store in an airtight container.